After several weeks of negotiations, the story out of Washington, D.C., really has not changed: Congress is making a deficit-compounding giveaway to big corporations and rich households at the ultimate cost of services for all, particularly the most vulnerable. The impact will be felt right here in Iowa, and across the country. 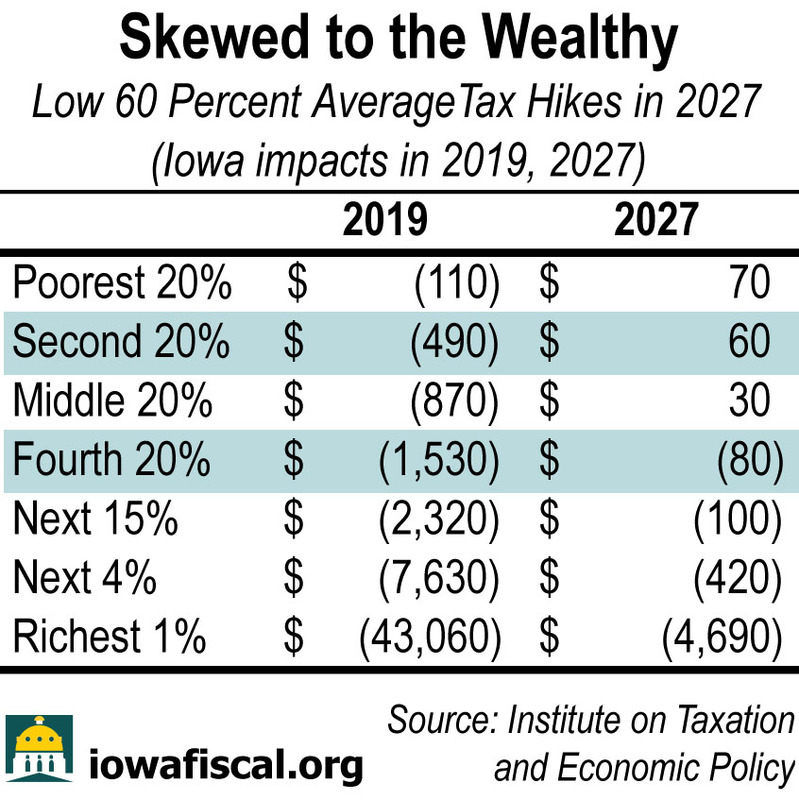 • In 2019, the richest 1 percent of Iowa households would get 25 percent of the tax benefit. The lowest two-thirds would see only 17 percent of the benefit. • By 2027, the expiration of benefits at low and middle incomes further skews the benefit to the rich. The lowest 60 percent would see an average tax increase, while the highest-income 40 percent would still see tax breaks. The biggest breaks come at the very top, with a $4,690 cut for households making nearly $1.5 million a year. This unprincipled approach at the national level sets a poor example for our state Legislature, which convenes again next month. That is an important point, because our state already faces enormous fiscal challenges, under elected leadership that wants to reduce tax revenues. With congressional leaders and the president setting the stage for cuts to food assistance, Medicaid, education, public safety and resources for roads, bridges and other infrastructure, it is difficult to envision how Iowans’ needs are going to be met. This bill puts the rhetoric of politicians and economic charlatans to the test — a test of trickle-down economics. It has never worked and will fail again. Responsible economists have warned of massive deficits, while the legislation will push millions off of health insurance they want and need. This Christmas-week package comes with bows and ribbons and promises of joy to the middle class, but its substance offers no promise at all. Worse than an empty box, it is packed with pain and hardship.